A few weeks ago, we did our traditional visit to the pumpkin patch, followed up by a family viewing of “It’s the Great Pumpkin, Charlie Brown.” This viewing was made even better by a friend who joined us that night, who couldn’t remember having ever seen the cartoon. It was sweet to make the introduction to him. “Great Pumpkin” will never surpass “A Charlie Brown Christmas” for me, but it’s very dear to my heart, mostly because so much of the story centers around Linus. Linus, Lucy’s little brother, that blanket-toting, pure-hearted boy, is sure that the Great Pumpkin will rise out of the pumpkin patch come Halloween night. 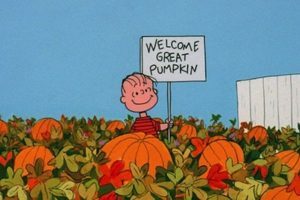 In the face of protests from Charlie Brown and other friends, and even his own sister’s threat that she will “pound” him, Linus carries on in his sincere belief that the pumpkin will appear. Only Sally, Charlie Brown’s little sister, supports Linus, but it’s mostly because she is smitten with him. He carries on in his ‘sincere belief’ — sincerity is the word of the day for Linus. The Great Pumpkin never appears, and as the night wears on, Linus’ friends mock him. Sally deserts him, angry that she has missed trick or treating with the rest of the gang. As everyone retreats to their homes for the night, Linus promises to put in a good word for them with the Great Pumpkin “if he comes.” “If”?! Linus panics. He should have said, “when!” He’s terrified that the Great Pumpkin will pass him by because he gave the tiniest indication of doubt. Linus quietly assumes the stage, calls for the lights to be dimmed, and recites Luke 2:8-14. Cue the tears. 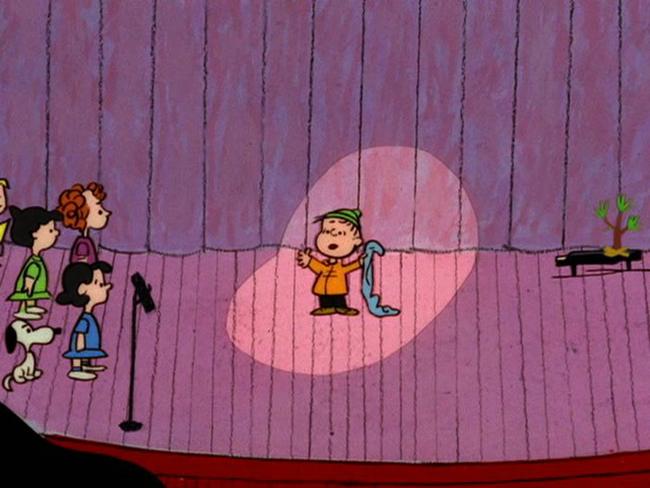 Little Linus, alone in the spotlight, has bravely stood against the tide of selfishness in his friends and made the point: Christmas is not about you. It is about an event — in Bethlehem. It is about a person — Christ the Lord. Could it be that Linus’ willingness to believe in the Great Pumpkin laid the groundwork for his understanding of the true meaning of Christmas? I say yes. Fiction can lay the groundwork for faith in a positive but subversive way. It interacts with our imagination. It links our head and our heart. It helps us to imagine a world we don’t see in front of us. Isn’t this what true faith does: causes us to live for a world we cannot (but will one day) see? He said, “That reminds me of The Lord of the Rings, when Gandalf says ‘A wizard is never late, nor is he early; he always arrives precisely when he means to.’” (Tolkien purists, my apologies — this quote is in the film only, not the book.) What my son was doing in that moment was trying to get his arms around what it means to wait for a sovereign God. You might feel a little like Frodo — confused, and knowing you wouldn’t choose it to be that way, but ultimately trusting Gandalf’s character and history of keeping his promises. In a similar way, Linus’ eagerness to believe in the Great Pumpkin, despite his friends’ cynicism and outright hostility, lays a good groundwork for his faith. He is open to wonder. He desires sincerity, a feat that is downright noble in our age filled with sarcasm and skepticism. He is willing to believe in the supernatural. But consider the difference between his “belief” in the Great Pumpkin versus his belief in the true meaning of Christmas. In October, he is frantic, nervous — he’s afraid if he says the wrong thing, he’ll get passed over. In December, he is settled, quietly confident that he knows the truth. This Christmas, we as parents ought to focus on the One Great Story. But let us not fear entering into lesser stories. These smaller stories, when they are allowed to do their work, serve us and allow children to access that One Great Story. Merry Christmas, Linus. And thank you. I love the connection you\’re drawing between Linus\’s experiences at Halloween and Christmas! Hah! Wow. Such a beautiful piece, Kelly!